The Curious Silence of The Old Testament Regarding 'Hell' Warrants The Question - What Kind Of Lawgiver Keeps The Worst Penalty A Secret? God warned them that the penalty for eating of the Tree of the Knowledge of Good and Evil was death. 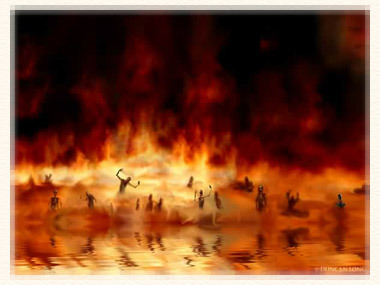 Not a single word was breathed about them being forever suffering in the fires of Gehenna. Oh wait a minute. Could that possibly be because Gehenna didn't yet exist? Even after Adam and Eve transgressed, God banished them from the garden (Genesis: 3:23). The man was cursed with having to work for food, the ground that was also cursed would hand him thorns and thistles (Genesis: 3:17-19). The woman was cursed with great pain in childbirth (Genesis: 3:16). (Note also that not a word was said about the supposed consequence of Adam's descendants inheriting his sin, and consequently not being able to respond to God. See Original Sin.. Fact Or Fable? God said absolutely nothing about endless torment beyond this life, and certainly the concerns Cain expressed were confined to this life. Perhaps one of the best examples are the blessings and curses of Deuteronomy 28. Deuteronomy chapter 28, verses 1-14 lists the blessings that would come to the nation of Israel if they obeyed the Lord's commandments. They would abound in prosperity - The Lord would give rain in its season to their land, bless their basket, their kneading bowls and the produce of their ground . He would also bless their offspring and the offspring of their beasts. They would be the head and not the tail. Their enemies would flee before them and they would lend to many nations, never borrow. Then, from verse 15 on the rest of the chapter speaks about the curses that would come upon them if they did not keep His commandments. See What Arouses God's Wrath? These curses touched every facet of their lives. Everything that He promised to bless would be cursed, including their offspring, their health, their land, and their crops and herds. (Read the entire chapter). They were warned that the heavens would not give them rain and they would be struck down with consumption, fever, the boils of Egypt, tumors etc. from which they would not be healed. They were told that they would be the tail and not the head - oppressed and robbed with none to save them. Their ox slaughtered before their eyes and their donkeys taken away.. and that a man would get engaged, but another would violate her. He would build a house, but another would live in it - plant a vineyard but not enjoy its fruit nor drink its wine. The stranger living among them would prosper as they themselves would not. They would suffer hunger, thirst, and the desolation of their country by their enemies. Finally, they would be scattered among the nations of the earth, but would find no rest, and never have assurance of safety. Not only was every single penalty to be imposed on them here on earth, but this list of curses makes no mention of the worst one of all - eternal punishment in hell. The entire history of Israel reflects that God was true to His word. When the people were obedient they prospered and defeated their enemies. But numerous calamities befell them when they rebelled, including being taken captive by the Babylonians for seventy years. In fact, it doesn't matter which of the Old Testament books you read. Every transgression, be it by priest, king, or peasant was dealt with in the here and now. As the author of Hebrews said every transgression received "just recompense". If they have already received "just" recompense then, quite obviously, a 'just' God will not give them any more punishment. A Few Examples Of a "Just Recompense"
Eli's Sons. After Eli's sons Hophni and Phinehas disgraced the priesthood without being restrained by their father, God prophesied that both of them would be killed in one day. This happened shortly thereafter in the battle with the Philistines That saw the Israelites completely routed, and the ark taken. See 1 Samuel 2:27 and 4:1-11. King Saul. The first king's reign was marked by a continuous disobedience to God's instruction beginning with his failure to wipe out the Amalekites. When he instructed the medium of Endor to summon the prophet Samuel, Samuel told Saul that because of his disobedience he would die the next day. Haman was hung on the gallows that he had prepared for Mordecai. In all the above examples and the many more to be found in the Old Testament, death was virtually always the punishment of the transgressors- the silence deafening when it came to any punishment after that. However, you may have noticed that two separate parties - king David and the nation of Israel as a whole were not eliminated as punishment for their transgressions for which there is a good reason. The Messiah was to be a 'son' or descendant of David born into the nation of Israel. But make no mistake - they paid very dearly for their transgressions. The Northern kingdom of Israel was almost completely decimated by the Assyrians and the Southern kingdom carried away into a seventy year captivity by the Babylonians. David, guilty of both adultery and murder, was specifically punished by the death of his firstborn. However, in the final analysis David suffered a tarnished reputation, a kingdom in shambles, a disgraced daughter, several disgraced concubines, and four dead sons.